This image staring out at me from today's Guardian brought back some memories I have to say. 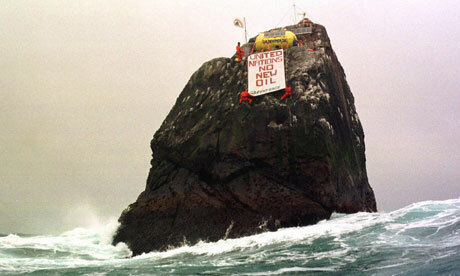 It seems that Rockall now might be sitting atop billions of quids worth of oil. For an inglorious two years of my life I worked in the MOD as a trainee top civil servant(I found I was wholly unsuited, so left in 1972). I worked in DS5 during 1971, the policy division advising on naval policy and worked for a while alongside Kevin Tebbitt, later the department's permanent secretary (and someone whose brilliance, I recall, was matched only by his casual arrogance). The job was disappointingly ghastly for one of my administrative autism; the only interesting job I remember doing was organizing the naval expedition to Rockall in 1971. The idea was to follow up the formal annexation of the island in 1955 with an act which I think reinforced the idea that any underlying mineral resources would legally be British and not Irish, Icelandic or Danish, depending which countries claim to the island one supported. "Rocks which cannot sustain human habitation or economic life of their own shall have no exclusive economic zone or continental shelf." So all that effort was wasted as well as condemned as 'an act of vandalism' by John Vidal, also in today's Guardian. I have two further memories of the episode. Firstly a member of the public, a Mr Bizony, wrote in asking to be included in the expedition and I, impressed by his amateur enthusiasm, worked hard and eventually successfully to get him accepted on board- the naval professionals were quite sniffy about it initially. Secondly, a few days after the expedition my opposite number in the DTI Lighthouses section rang to ask when we were going to organise next years trip. Next year? Oh my god! said my superiors, can't do that, need ships for training and..er.. defending the country sort of thing. Well, said the DTI, we need to do annual visits to change the batteries in the beacon or it'll stop operating. Change the batteries? why didn't you tell us? Well, we thought it was so obvious we didn't need to.Vidal said the beacon 'probably never worked. I think I know why: nobody had thought that the batteries needed changing. The sort of minor but embarrassing oversight which happens in government every day but which rarely comes to light.